If new rocket engines being developed by the European Space Agency (ESA) are successful, they could revolutionize rocket technology and change the way we get to space. The engine, called the Synergistic Air-Breathing Rocket Engine (SABRE), is designed to use atmospheric air in the early flight stages, before switching to conventional rocket mode for the final ascent to space. If all goes well, this new air-breathing rocket could be ready for test firings in about four years. Conventional rockets carry their own oxygen because its temperature and pressure can be controlled. This guarantees the performance of the rocket, but requires complicated systems to do so. SABRE will eliminate the need for carrying most on-board oxygen, but this is not easy to do. SABRE’s challenge is to compress the atmospheric oxygen to about 140 atmospheres before introducing it into the engine’s combustion chambers. But compressing the oxygen to that degree raises its temperature so much that it would melt the engines. The solution to that is to cool the air with a pre-cooling heat exchanger, to the point where it’s almost a liquid. At that point, a turbine based on standard jet engine technology can compress the air to the required operating temperature. This means that while SABRE is in Earth’s atmosphere, it uses air to burn its hydrogen fuel, rather than liquid oxygen. This gives it an 8 x improvement in propellant consumption. Once SABRE has reached about 25 km in altitude, where the air is thinner, it switches modes and operates as a standard rocket. By the time it switches modes, it’s already about 20% of the way into Earth orbit. Like a lot of engineering challenges, understanding what needs to be done is not the hard part. Actually developing these technologies is extremely difficult, even though many people just assume engineers will be successful. The key for Reaction Engines Ltd, the company developing SABRE, is to develop the light weight heat exchangers at the heart of the engine. Heat exchangers are common in industry, but these heat exchangers have to cool incoming air from 1000 Celsius to -150 Celsius in less than 1/100th of a second, and they have to do it while preventing frost from forming. They are extremely light, at about 100 times lighter than current technology, which will allow them to be used in aerospace for the first time. Some of the lightness factor of these new heat exchanges stems from the wall thickness of the tubing, which is less than 30 microns. That’s less than the thickness of a human hair. Reaction Engines Limited says that these heat exchangers will have the same impact on aerospace propulsion systems that silicone chips had on computing. A new funding agreement with the ESA will provide Reaction Engines with 10 million Euros for continued development of SABRE. This will add to the 50 million Pounds that the UK Space Agency has already contributed. That 50 million Pound investment was the result of a favorable viability review of SABRE that the ESA performed in 2010. IN 2012, the pre-cooler and the heat exchangers were tested. After that came more R&D, including the development of altitude-compensating rocket nozzles, thrust chamber cooling, and air intakes. Now that the feasibility of SABRE has been strengthened, Reaction Engines wants to build a ground demonstrator engine by 2020. If the continued development of SABRE goes well, and if testing by 2020 is successful, then these Air Breathing rocket engines will be in a position to truly revolutionize access to space. Tourist attractions can be pretty hokey. In the part of Canada where I’m from, one town boasts the “largest hockey stick in the world.” I’m not kidding. You can see it when you drive by. But Mississippi is getting what may be one of the world’s greatest tourist attractions: a Saturn V rocket, or the first stage of one, anyways. Obviously, this is more than just a tourist attraction. This is an historic science exhibit of epic proportions. This Saturn V is the rocket that was supposed to launch Apollo 19 to the Moon in 1973, until that trip was cancelled. For 38 years, this Saturn V has been at its home at NASA’s Michoud Assembly Facility in New Orleans, where it was built more than 40 years ago. But now, it’s found a new home at the Stennis Space Center, about 77 km. (48 miles) away. And getting there is quite a journey. The heart of this journey is a 64 km. (40 mile) trip through the Intercoastal Waterway, and up the Pearl River. Not only that, but it had to be loaded onto a barge to start the trip, and unloaded once it arrived. The Saturn V on its way to its new home at the Infinity Science Center in Mississippi. Image: Infinity Science Center. The actual home of the Saturn V will be the Infinity Science Center, which is a non-profit science outreach organization that has partnered with NASA, and is located next to the Stennis Space Center in Mississippi. And people there are proud and excited to be a part of this. There’s a lot of history behind the Saturn V. It was developed to support NASA’s Apollo program to land men on the Moon. The Saturn V was launched 13 times between 1966 and 1973. It still retains its status as the world’s most powerful rocket, though its end will reign soon, thanks to NASA’s Space Launch System (SLS) and SpaceX’s Falcon Heavy. This Saturn V was supposed to carry Apollo 19 on its way to the Moon until that missions was cancelled. One of the would-be crew members of Apollo 19, Fred Haise, was also a crew member on the ill-fated Apollo 13. Fred Haise is now on the Board of Directors at the Saturn’s new home, the Infinity Science Center. I can’t imagine how pleased he is to have his Saturn V coming home. The Saturn V is a three stage rocket. The section being moved and exhibited is the first stage, known as the S-IC. It’s 42 meters (138 ft.) long and 10 meters (33 ft.) in diameter. This first stage had five massive F-1 engines which produced more than 7.5 million pounds of thrust. The engines combined and burned liquid oxygen and kerosene for about 2.5 minutes. At that point, the rocket would be 61 km (38 miles) above Earth. Then, empty of fuel and with its job done, it would fall back towards Earth and burn up. But this one was built before its mission was cancelled, which is why its available for display. The Infinity Science Center has 72,000 square feet of space, and has over 50 years of NASA history on display. Over 65,000 guests visit each year. That number is sure to rise, once the Saturn V comes home. Do you get the feeling that Elon Musk likes making bold announcements? Every space enthusiast’s favorite billionaire-turned-space-entrepreneur has just announced that he hopes his company, SpaceX, will send humans to Mars in 2024. If this sounds outrageous, you’re not keeping up with developments in commercial space. If this sounds a little bit ambitious, you’re probably right. But ambition is what Musk is all about. Musk, of course, is the Paypal co-founder who went on to start the Tesla electric car company, and SpaceX, the private space company. SpaceX has achieved a lot in its short time, including developing the Falcon re-usable rocket and the Dragon delivery and re-supply craft. With an even more powerful rocket in development, the Falcon Heavy, it’s fair to say that Musk has a track record of delivering on ambitious projects. Musk’s announcement, at the Code Conference 2016 in Los Angeles, is definitely exciting news. It comes on the heels of an announcement earlier this spring stating that SpaceX will send a Dragon capsule to Mars in 2018, albeit one with no personnel on board. Musk founded SpaceX in 2002 with the goal of advancing the technologies required to establish a human colony on Mars, so everything seems to be going according to plan. But a colony needs supplies, and with that in mind Musk also announced the intention of sending a craft to Mars every two years, in order to establish a supply line. “That’s what’s necessary to create a self-sustaining, or a growing, city on Mars,” he added. Of course, there’s lots of work to be done yet. Currently, there is no rocket powerful enough for a mission like this. The most powerful rocket ever built was the Saturn V, used to get the Apollo mission to the Moon. That was 50 years ago. NASA’s Space Launch System will have the power for a Mars mission, but that’s a ways away, and they probably won’t be giving SpaceX one. SpaceX has developed the Falcon rocket, and are working on the Falcon Heavy, but it won’t be enough to establish and maintain a presence on Mars. Still, this obstacle is anything but insurmountable, even though there has been no announcement on the building of this required rocket. This whole endeavour will be enormously expensive, of course. But with a growing customer base for SpaceX, including the US military, NASA, and commercial communications customers, it seems like the money will be there. The announcement itself sounds so simple. But Musk knows, as does everyone else involved in planning these kinds of missions, that there is an enormous amount of complex detail behind it all. The food required, the energy needed, and all of the other things that a sustained human presence on Mars will require in order to succeed, are all waiting to be addressed. Musk plans to address some of these details in September at the International Astronautical Congress in Guadalajara, Mexico. Musk generates a lot of headlines when he makes these announcements. That’s as it should be. But there are other plans to reach Mars, too. NASA is planning to get to Mars, but they’re going about it differently. They plan on using their SLS and the Orion to explore what’s called cis-lunar space, near the Moon, to test deep space operations, life support systems, solar-electric thrusters, and habitats. 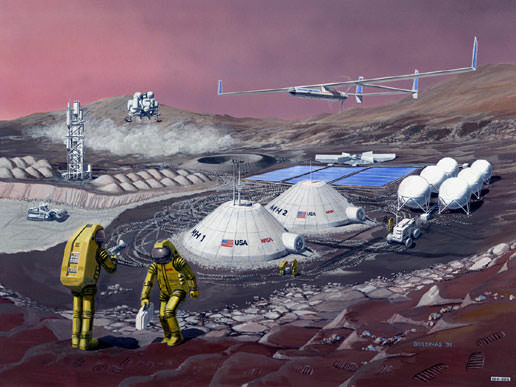 All of this activity could start as soon as 2021, and would support an eventual round-trip mission to Mars in the 2030s. For a long time, it seemed that a mission to Mars was out of reach, off the table, and nobody was really talking about it. Now, we have two separate programs aiming toward an eventual mission to Mars. Could this be the new space race? But instead of capitalism versus communism, as in the original space race, it’s government versus private? In the end, it won’t really matter. We just want someone to get there. And we want an established presence. A colony. Though no date has yet been set for this gimped-parachute demonstration, we are looking forward to it. In previous tests, the crew capsule performed maneuvers that characterized its aerodynamics and reduced what are called ‘model uncertainties.’ Greater predictability is what these test flights are designed to achieve. Obviously, too many question marks are not good. The company also shared news of the construction of additional test cells at its facility in West Texas. These cells were announced in October, and now one of the cells has been commissioned. This cell “supports the development of the pre-burner start and ignition sequence timing” according to Bezos. It’s clear that privately-funded initiatives can have more flexibility than governmental initiatives. They don’t face the same budgetary wrangling that organizations like NASA do. But, they don’t command the same resources that NASA does. Companies like Blue Origin an SpaceX are very innovative and are leading the way in reusable rockets. If Blue Origin can make the crew capsule survivable in a failed parachute scenario, as the next test aims to do, then commercial space flight will benefit. Private trips to space, which are one of Blue Origin’s goal, will also become more and more attainable. We know that Earth will die. Even if we beat global warming, and survive long enough to face and survive the next ice age, Earth will still die. Even if we build a peaceful civilization, protect the planet from asteroids, fight off mutant plagues and whatever else comes our way, life on Earth will die. No matter what we do, the Sun will reach the end of its life, and render Earth uninhabitable. So reaching for the stars is imperative. What sounds unrealistic to a great many people is a matter of practicality for people knowledgeable about space. To survive, we must have more than Earth. A project launched by billionaire Yuri Milner, and backed by Mark Zuckerberg, intends to send tiny spacecraft to our nearest stellar neighbour, the Alpha Centauri system. With an expert group assembled to gauge the feasibility, and with the support of eminent cosmologist Stephen Hawking, this idea is gaining traction. Stephen Hawking thinks reaching out to the stars is more than dreamy space talk: it’s essential to the survival of the human species. He’s smart. We should listen to him. The distance to the Centauri system is enormous: 4.3 light years, or 1.34 parsecs. The project plans to use lasers to propel the craft, which should mean the travel time would be approximately 30 years, rather than the 30,000 year travel time that current technology restricts us to. Of course, there are still many technological hurdles to overcome. The laser propulsion system itself is still only a nascent idea. But theoretically it’s pretty sound, and if it can be mastered, should be able to propel space vehicles at close to relativistic speeds. There are other challenges, of course. The tiny craft will need robust solar sails as part of the propulsion system. And any instruments and cameras would have to be miniaturized, as would any communication equipment to send data back to Earth. But in case you haven’t been paying attention, humans have a pretty good track record of miniaturizing electronics. Though the craft proposed are tiny, no larger than a microchip, getting them to the Alpha Centauri system is a huge step. Who knows what we’ll learn? But if we’re ever to explore another solar system, it has to start somewhere. And since astronomers think it’s possible that the Centauri system could have potentially habitable planets, it’s a great place to start. NASA is about to reach another milestone in the development of its Space Launch System (SLS.) The SLS is designed to take humans on future deep space missions, and the heart of the system is the RS-25 engine. March 10th will be the first test of this flight-model engine, which will be the most powerful rocket in the world, once in its final configuration. SLS is the future of space flight for NASA. It’s planned uses include missions to Mars and to an asteroid. The rockets for the system have to be powerful, and they have to have a proven track record. The RS-25 fits the bill: they are a high-performance system that has seen much use. The RS-25 has been used on over 135 shuttle missions, and they have seen over 1 million seconds of hot-fire time during ground testing. For the SLS, four RS-25s will be used to generate over 2 million pounds of thrust, and they will operate in conjunction with two solid rocket boosters. “This year is all about collecting the data we need to adapt these proven engines for SLS’s first flight,” says Steve Wafford, the SLS Engines Manager. The team conducted a series of tests on a developmental RS-25 engine last year, but this is the first one that will fly. Ronnie Rigney is the RS-25 project manager at the Stennis Space Center, where the tests are being conducted. “Every test is important, but there really is a different energy level associated with flight engines. It’s hard to describe the feeling you get knowing you’re going to see that engine lift off into the sky one day soon. It’s a very exciting time for all of us here,” said Rigney. Block 1 will have a 70 metric ton lift capability. Block 1B will be more powerful for deeper missions and will have a 105 metric ton lift capability. Block 2 will add a pair of solid or liquid propellant boosters and will have a 130 metric ton lift capability. Each of these blocks will use 4 RS-25 engines, and in its Block 2 configuration it will be the most powerful rocket in the world. Engine #2059 is more than just a test engine. It will be used on the second SLS exploration mission (EM2), which will carry 4 astronauts into lunar orbit to test the SLS spacecraft. “You can’t help but be excited about the test on A-1 (test stand,) especially when you realize that the engines that carried us to the moon and that carried astronauts on 135 space shuttle missions were tested on this very same stand. We’re just adding to a remarkable history of space exploration,” said Stennis Space Center Director Rick Gilbrech. The team at Stennis feels the characteristic enthusiasm that NASA is known for. “We’re not just dreaming of the future. We’re enabling it to happen right now,” said Rigney. Though the March 10th test is definitely a milestone, there’s still lots more work to do. Testing on RS-25 engines and flight controllers will continue, and in 2017, testing of the core stage will take place. 4 RS-25 engines will be tested at the same time. That will be quite a sight.